Translated from the Hebrew into Portuguese by Meir Lumbroso. Tunis, 1661.
f. 1v, 2v, 3, 65v, 66v: blank. f. 4: Index of subjects. f. 25, 35, 53r, 55r, 62r, 63r, 66r: Some Hebrew annotations. 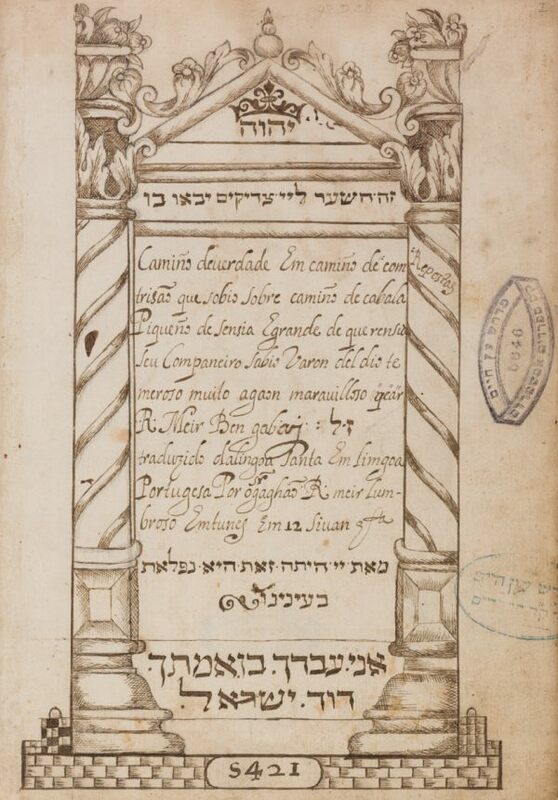 The Hebrew edition of the work Derekh Emunah was published for the first time in Padua, 1652. On the last 4 ff. some later Hebrew and Portuguese grammatical annotations and ownership inscription in several styles of writing of Abram Abatear Mello. Portuguese with Hebrew annotations / Paper / 24,7 x 17,6 cm. /  + 67 +  ff. / 18 lines to a page / Neat Iberian writing with square unvocalised writing on the title / Annotations in the margin in a smaller 18th century hand / Title written in drawn ornamental frame / Kabbalistic drawing on f. [2r] / Contemporary leather binding. Fuks 118. Fundação Calouste Gulbenkian.